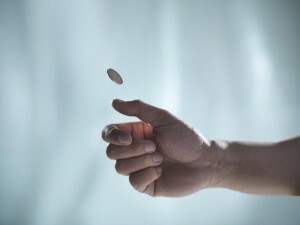 A coin flip lands heads three times in a row. What are the odds that it will be heads on the next toss? A rational decision-maker knows that they are 50-50. But it’s easy to succumb to the belief that streaks don’t occur by chance. This common misperception is known as the gambler’s fallacy. In “Decision-Making under the Gambler’s Fallacy: Evidence from Asylum Judges, Loan Officers, and Baseball Umpires,” Daniel Chen, Tobias J. Moskowitz and Kelly Shue found that in a number of different settings, individuals have a slight bias against deciding the same way in successive cases. The researchers found, for example, that the odds that a judge rejects an asylum seeker are 3.3 percentage points higher if the judge has approved the previous case, all else being equal. They also noted that the likelihood that judges are influenced by a prior decision increases with the length of the sequence of positive or negative rulings and the similarity of the previous cases. It’s easy to succumb to the belief that streaks don’t occur by chance. This common misperception is known as the gambler’s fallacy. The researchers also studied loan officers in India. The officers were asked to review loan application files that had already been processed and to make recommendations about whether to approve the loan. They faced different incentive schemes, which placed different degrees of emphasis on an accurate assessment. Because the files had been reviewed previously, the authors could evaluate the quality of the officers’ decisions by examining the actual performance of the loan and exploring whether recommended loans on average were performing better. Under a flat incentive scheme which rewarded approvals regardless of loan quality, officers — who rejected many loans despite the incentive, perhaps out of intrinsic or reputational motivation — were 8 percentage points less likely to approve the loan currently under review if they had approved the previous loan. This bias became much less significant under plans with stronger incentives for accuracy. Turning to baseball, the researchers analyzed major league umpires. They examined 1.5 million called pitches when the batter did not swing between 2008 and 2012. They controlled for a wide array of factors, such as pitch count, pitch spin and acceleration, the relative importance of the at bat to the outcome of the game and whether the batter was on the home team. They relied on data compiled by the PITCHf/x system, which tracks the speed and trajectories of pitches in every major league stadium. 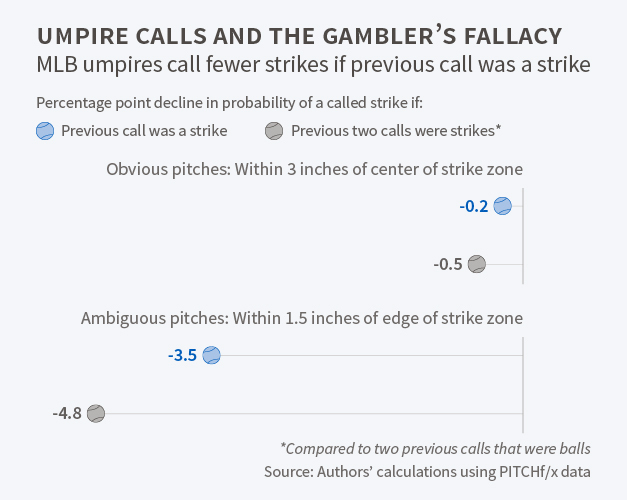 They found that umpires were 1.5 percentage points less likely to call a strike if the previous pitch was a called strike. The bias toward an opposite call was also significantly more pronounced when the previous two calls were the same. The researchers discovered that the gambler’s fallacy tends to be more evident following longer streaks of decisions in the same direction and when the previous cases have similar characteristics and occur closer in time. It was less evident among more experienced decision-makers.